Can i receive a quote for a custom board? Yes, there are two ways to receive a quote. One, please click on the “Request for Quote” tab and fill out the information requested. Two, you may call us direct at 330-262-0712 (Mon-Fri: 8:00am-4:30pm EST). What is the order minimum quantity? The minimum order is 10 boards. We typically ship two to four weeks from the time the design is approved and material is available. How do the boards ship? Small orders that weigh less than 100 pounds total can ship UPS, Fedex or USPS. Larger orders that will weigh in total more than 100 pounds usually ship LTL. Shipments are made either third-party bill, prepaid or collect. We have shipped full truck loads and have had clients pick up their order at our plant. We’ll ship the most cost effective way. What are the standard colors? print full color in house. Just let us know what you need. *Custom color charges may apply. We accept Visa, MasterCard, Diner’s Club, American Express, Discover, Pay Pal, cash, ACH and checks. All information contained within this website, including the photos, data and descriptions are subject to change without notice. While Danroc.com has made every effort to provide correct information, the correctness of the information, graphics and other data on this website cannot be guaranteed. 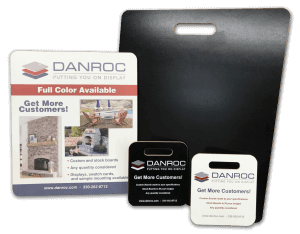 Danroc.com will not be responsible for any loss or damages of any kind due to the use or misuse of the product(s) purchased.